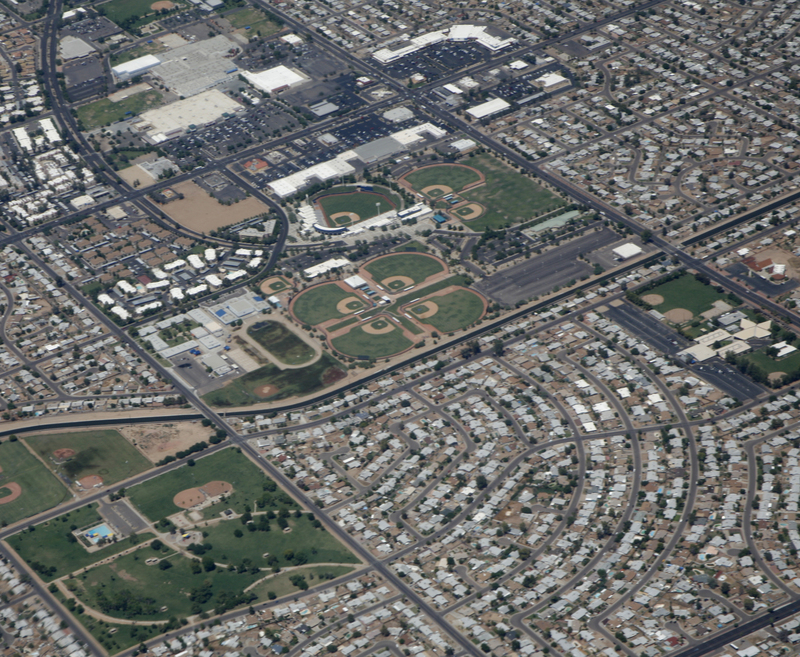 Home to the Arizona Brewers baseball team, Maryvale is a populous urban village located on the west side of Phoenix. Featuring a dense population, this 37.6 square mile neighborhood is known for its neighborhood involvement and local activities. Built in the 1950’s and 1960’s by renowned developer John F. Long, Maryvale was the first master planned community in Arizona – and one of the first in the nation. Following this early example, planned communities began to sprout up around nearby cities, adding to the urban sprawl of the later years. Having experienced years of crime during the 1980’s and 1990’s, the residents of Maryvale have reclaimed their neighborhood in recent years, once again making the area once again a thriving urban area that is sought after by many young professionals. Today it houses the Ak-Chin Pavilion, one of the leading entertainment venues for the metropolitan Phoenix area. Seating more than 8,100 guests under a pavilion roof and an additional 12,000 on a hillside behind the main stands, the amphitheater features a variety of public shows which has helped bring Maryvale back to life. With so much expansion comes the need for more – and better – internet services. While other internet providers in Maryvale offer standard services to both homes and businesses there, Phoenix Internet has helped bring the neighborhood back to life by offering an expansive array of internet services to the community. Quick Hassle-Free Upgrades: Thanks to the technology used to bring Phoenix Internet service to its customer base, subscribers are assured speed and other upgrades in less than 24 hours. Reliable Service: with no cables or satellites to worry about, service disruptions are minimal – even during bad weather conditions. Want to learn more about what Phoenix Internet offers? Take a short 10 minute drive down N. 51st Avenue until you reach the fork at N. Indian School Road, where you will want to take a left. Then, make a right at N. 31st Street, followed by a left onto W. Clarendon Ave to reach our offices at 2922 W. Clarendon Ave, Phoenix. You can also get in touch with us here!